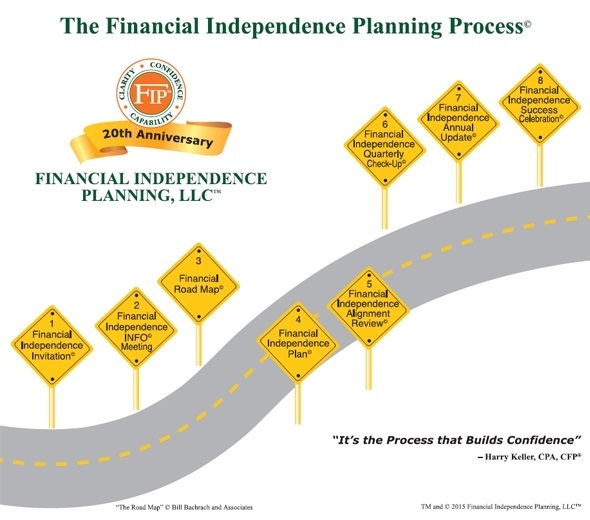 The advisors at FIP are seasoned professionals who use the Financial Independence Planning Process® -- a unique 8-step system. It is arranged to help make sure that the components of your assets, income, and expenses are organized in a structured, logical and customized Financial Independence Plan®. Our experienced team members know our clients well and have earned their trust. As a team, we carefully assess our clients’ goals, objectives, risk tolerances and time horizons. We then align their investments into suitable investment models which are carefully developed and regularly updated by the Financial Independence Planning Investment Committee. Of course, we seek to help minimize taxes and risks and to protect principal in investment selections. This system has helped many families in the region not worry about money and enjoy the things in life that are important to them. WHAT DO WE DO DURING THE QUARTERLY CHECK-UP? It is the contact to review progress towards your goals, update records for new information, answer any financial questions, review investment allocation, taxes, performance, discuss additions and withdrawals, follow-up on open action steps and make any other necessary adjustments. We do not leave it to you to trigger a call to us. While this may occasionally happen, just because “life happens”, we believe that planning ahead is a better option to ensure you maintain clarity in your financial planning. An invitation or referral to meet with a Financial Independence Planner© for a short complimentary informational INFO© discussion of your goals and concerns and of the Financial Independence Planning Process©. The objective of the Financial Independence INFO© Meeting is to get answers to your general questions on retirement planning, investments, taxes and insurances; learn the differences between investing and financial planning, and determine if the Financial Independence Planning Process© can benefit you. The Financial Road Map© is a consultation with a Financial Independence Planner© to clarify your values, goals, current financial positions and to identify ideas to improve your current plan. Also, you will have the opportunity to experience a time tested financial planning process that can help you make smart choices with your money and stay on track to your goals. The objective of having a Financial Independence Plan© is to give you the confidence to help make the right choices to reach your goals. This Plan is an active illustration using current financial tools and the Financial Independence Planners’© experience that maps out what has to happen to bridge the gap from where you are now to where you need to be in each of the areas of cash reserves, investments, debt and insurances. The Financial Independence Plan® includes the Financial Independence Recommendations© and implementation of steps you need to take to achieve your goals. The objective of the Financial Independence Alignment Review© is to help make sure all your assets are properly positioned to be on track to meet your goals. Furthermore, we take the time to familiarize you on how to access your on-line performance reports, update your active Financial Independence Plan® for any changes and review open action steps. The objective of the Financial Independence Quarterly Check-Up© is to give you confidence that you are on track towards your goals. In addition, we update records for new information, answer any financial questions, review investment allocation, taxes, performance, discuss additions and withdrawals, follow-up on open action steps and make any other necessary adjustments. In addition to providing assistance for your day-to-day administrative needs on your account(s), you will hear from our client services staff regularly when they call you to schedule our the Quarterly Checkup©. To ensure that we gauge how well your plan is aligned to your current needs, we initiate a Quarterly Check-Up so that we can plan for contingencies or anticipated changes. For instance, if you are expecting your daughter to get married and have some celebratory expenses, we can help you analyze which assets you might consider to use. Or, in these times of business mergers and acquisitions, your employer may be in discussions for purchasing another firm or conversely, is being purchased. Then we would discuss whether or when you might consider exercising your stock options and what you would do with your lump sum or annuity if you anticipate retiring from the company during this acquisition period. We love to hear from our clients, which we do regularly when they send us postcards from all over the world. Similarly, we promise that you will hear regularly from us. The Financial Independence Annual Update© is an annual meeting to review the progress toward your goals, update your Financial Independence Plan®, answer questions, review investments, allocations, review taxes and performance, discuss additions and withdrawals, follow-up on open action items and to determine if any other adjustments need to be made. The Financial Independence Success Celebration© is the culmination of the Financial Independence Planning Experience. We host annual client events to celebrate our clients’ achievements, share experiences and ideas about their goals.